How Many Plants, Trio Mixes, or Perfect Planters Combinations do I need? All of our plants are grown and shipped in large 4" pots. The chart below is a guide to the number of Individual Plants, Trio Mixes and Planter Packs to order for your containers, landscape and garden areas. Dimensions given are the inside dimension of containers. The number of plants needed depends upon three factors; 1.) how long is your growing season 2.) if you are looking for instant gardens or willing to let the plants finish growing and 3.) how large the plants you selected grow. The charts below are a middle of the road estimate considering all factors. If you live in one of northern climates (Zones 3,4, or 5) or if you are looking for instant flower boxes you may want to increase the number of plants, but watch for overcrowding later. For those with growing seasons longer than 4-5 months or for larger plants you may needs less plants and want to plant them a little further apart. In containers flowers are generally planted closer together than in garden beds because the plants will spill over the edges. Number of Trio Mixes Needed: With 3 plants per pot you need fewer plants! What is the Sun Requirements for Plants Mean? The amount of sun your garden area will receive is one of the most important considerations that should be taken into account when selecting your plants. 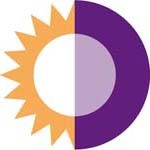 Remember that the intensity and heat of the morning sun is different than the afternoon sun as well. Below is a guide to the sun exposure requirements that will help your garden areas succeed. What is a Plants Growth Habits? Each plant has a unique growing habit. One of the items that makes a container, landscape or garden beds interesting is a mixture of different types of growth habits. Upright Plants: Stems grow upwards. Excellent for garden area and height in container. Mounding Plants: Stems grow up and then start to trail. Great for filling in garden areas and mounding/cascading in containers. Trailing Plants: Stems grow primarily down and then start to trail. For ground cover and trailing over containers. Annuals offer bold, consistent color and blossoms throughout the season from planting until frost. annuals Annual flowers are great for all your baskets, boxes, and beds that you want beautiful consistent color through out your growing season. All our plants are considered annuals but may last year-round in frost-free areas. Perennials have their place as grow back year after year but only bloom for a few weeks. Fill in and around your perennial beds for added color, texture, and interest. What is a Garden Heat Zone? Most of our annual plants can be grown throughout the United States and are very adaptable to a wide variety of growing conditions. We have selected plants that are easy to grow, but remember that different plants like different growing conditions. When choosing plants think about where you would like to put them and then refer to the sun requirements, Garden Heat Zone number and other attributes listed for each plant. Be sure to select plants that are appropriate for your area. Minimum and maximum temperatures of a region play an important a role in successful plantings. The amount of heat a plant receives is different than the amount of sun a plant receives. The Garden Heat Zone Map below indicated the number of heat degree days above a certain temperature. Some plants can not endure sustained heat degree days, while others seem to thrive in the heat. 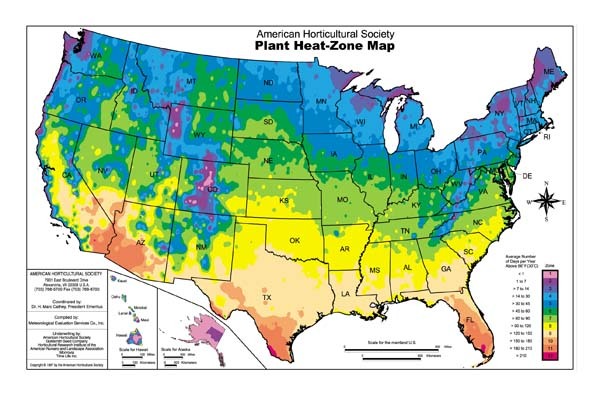 Check the HEAT TOLERANCE ZONE for every plant to determine if it can endure the heat degree days in your location. Even gardeners in cooler regions can have very hot spots in their yard such as next to brick walls, driveways and on decks. Plants that prefer cool temperatures will benefit from shade from the hot afternoon sun, especially plants in containers where roots cannot hide in the cool ground. How is planting in Containers different than planting in the landscape? Container plantings offer the perfect solution for making use of tight spaces, adding color when nothing's blooming in the ground or expressing your personal style. For healthier plants and more blooms, we recommend replacing the soil in your containers every year. Plants use nutrients in the soil to grow, and watering washes nutrients out of the containers. Use a commercial potting soil in containers, not top soil. Top soil is too heavy to permit adequate drainage in containers (garden beds must be fertilized every year for the same reasons). See our special commercial soil mix description and pricing. Good soil is the foundation on which to grow a good garden. The goal is to obtain rich, workable, well-drained soil that still contains organic life. Knowing your soil and the balance of its 3 primary minerals: sand, clay and silt, is the key to great flowers. If you don't already have great soil you can add different ingredients to help obtain better soil. A quick test to determine what type of soil you have is to grab a handful of soil and give it a gentle squeeze. If it stays together in a lump or ball it probably has too much clay in it for optimal plant growth. If that is the case add sand or silt to improve drainage. If the soil feels gritty and crumbles it probably has too much sand in it. If it feels smooth or powdery and wont hold any shape, its too high in silt. In either case, mix in some clay to help the soil retain more water. If the soil molds into your hand but crumbles apart when squeezed it has just the right texture sandy loam. Any soil will benefit from the addition of organic matter, ideally compost. Once you have figured out what your soil needs, spread the amendments on top of the soil and turn over the top 10 of soil, until the ground is loosened and the amendments are worked in. Smooth out the top of soil with a metal rake and you're ready to start planting! It may be necessary to do this for a few years to build up the organic matter in your soil. Another solution is to remove the soil in your bed to 12" deep and replace it with a good top soil bought from a reputable source. Plants in a garden or landscape bed benefit from deep, infrequent watering rather than frequent, light watering (soaker hoses work well in flower beds). Try to water early in the day to allow the foliage to dry before evening. This will help prevent disease outbreaks. Dry, windy areas will probably need watering every 2-3 days, more often if the soil is sandy and does not hold water well. Other areas should plan on watering 1-2 times a week. Containers on the other hand only have a limited amount of soil and dry out very quickly. Water with a hose on medium pressure and slowly count to ten to ensure the plants are adequately watered before moving on to the next plant. When the water is freely coming out of the bottom of the pot the pot has received enough water. Containers may have to be watered every day! When do I fertilize my plants? 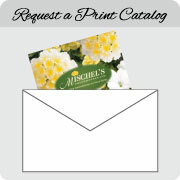 After your flowers have been planted and allowed to grow into their fresh soil for 1-2 weeks they will need fertilizing. Plants need nourishment on a regular basis to grow healthy and strong. That's where periodic fertilizing comes in. Fertilizers are available in granular, powder or liquid forms. Dry fertilizer usually is mixed with water and applied watered around the plants. Slow release granular fertilizer generally feeds plants over time (hence the name - slow release) as it dissolves at little every watering. Liquid fertilizer releases its nutrients the fastest and as with dry or powder fertilizers is usually diluted in water and spread around the base of the plants. NEVER APPLY FERTILIZER OF ANY KIND TO VERY DRY PLANTS. WATER FIRST AND THEN APPLY TO AVOID DAMAGING THE PLANTS ROOTS. The one you choose should be determined by your watering routine and personal preference. If using the wet fertilizer plan on applying it to your annuals once a week for your containers and once every other week for your landscape or garden beds. Make sure to follow manufacturers recommended rates. See our Special Slow Release Fertilizer!